Highly detailed photographs of the Moon taken by the Apollo missions are being made available to the public for the first time in more than 30 years. Photos taken on the Apollo 15, 16 and 17 missions in the 1970s showed the Moon in great detail but were only ever viewed by a few scientists. Since then they have been locked away in freezers by Nasa to preserve them. Arizona State University is now making them available from the internet after using high resolution scanners. "We're scanning the pictures in a very high bit resolution - 14 bits - which means that for each pixel, you have about 16,000 shades of grey," Mark Robinson, a professor of Geological Sciences and the principal investigator on the project, told BBC World Service's Digital Planet programme. "A typical scan of a negative or film is eight bits. So it's not only that we're scanning this at a very high pixel resolution - showing detail to five millionths of a metre - but it's also a high bit resolution, because we want to preserve as much of the original information as possible. "The negatives are also available to scientists as a permanent archive of these films, because they will not last forever." Many Nasa lunar images are already available through websites like Google Moon - but the pictures on the Apollo Image Archive are special because of the level of detail. One of the samples already posted online is an image showing high-resolution surface detail of the moon taken from a camera that was mounted on the Apollo 15 mission in 1971. The original raw scan, available for download, is 1.3 Gigabytes in size. The Apollo Image Archive is specifically designed both to give the high spatial resolution but also to give accurate geometric fidelity. Ordinary scanners are not designed to be geometrically perfect - something that can be shown by scanning a piece of graph paper. Prof Robinson said that the scanned images were of such fidelity and precision that stereo measurements could be made where the images overlapped - and therefore a follow-on project will be to make topographic images of the Moon. Meanwhile, more pictures will become available next year when Nasa's lunar reconnaissance orbiter spacecraft launches in October 2008. The orbiter will have three cameras - including a wide-angle camera that takes colour pictures and also has UV capabilities, designed to capture images of the poles and determine lighting conditions. "Over the course of a year, we will build up a movie of how lighting conditions exist at the poles," Prof Robinson said. "We also have two narrow-angle cameras which have extremely high resolution - 50cm a pixel - and those cameras will be used to find and evaluate potential future human landing sites." 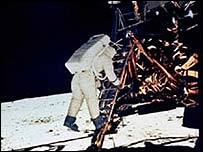 This is important - when the first manned mission to the Moon, Apollo 11, came into land, astronaut Neil Armstrong found that the designated landing spot was littered with boulders, and he needed to set down somewhere else. He in fact managed to do so with only a few seconds' worth of fuel left in his craft. "We will be taking over 100 images every day," Prof Robinson added. "They will all go out on the web page, probably within a couple of months of their acquisition."